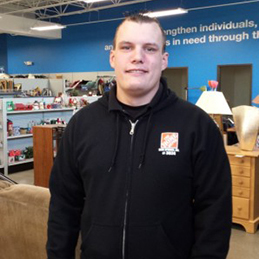 Perseverance paired with Goodwill landed Kevin Rhea a job with Home Depot in 2009. He’s still happily employed today. Meet Kevin. Kevin's story shows the power of perseverance when it’s paired with Goodwill. A learning disability was just one barrier that made it difficult for Kevin to find work. His case worker with Missouri Vocational Rehabilitation referred him to Goodwill for hands-on help to find a job. Kevin had encountered disappointment after disappointment in his search for employment. “I’d put in applications and call and they’d tell me they would call but they never did." Sure enough, Kevin got the call for an interview, another barrier Goodwill helped him overcome. With no transportation of his own, Kevin relied on his Goodwill career navigator to take him to the interview. His career navigator also provided emotional support from start to finish. “Prepping him for the interview, and then sitting there while he was being interviewed… just somebody familiar being there, that was a big help to him." The two also both followed up after the interview. Finally came the good news…a job offer “I was actually kind of excited,” Kevin says. Five years, a dozen customer service awards and a few promotions later, Kevin is still employed at Home Depot. He’s reached milestones, including independent housing and earning a driver’s permit, and continues to work toward new goals every day. Good goes further.